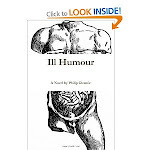 Texts & Pleasure: Excerpt from Forthcoming Novel: "Ill Humour"
I recently decided to revisit and edit a novel I wrote last year. At the time, I tried placing it with a few publishing houses. But you know how it is... Tough market out there. After cutting 20,000 words from that last version, I've decided to make another push at publishing it, and have resolved to self-publish if need be. Spanning over fifty years, Ill Humour tells the story of how Dr. Anna Mercer attempts to treat a patient named Adam Renfrew, whose sickness makes no sense within the terms of modern medical knowledge. But a chance encounter brings Anna into the company of Donald Firkin, a disgruntled and divorced English professor who soon determines that Anna’s patient makes all too much sense, just not according to modern science. Through a series of manipulations, Firkin convinces Anna that her patient’s internal organs have travelled backward through medical history, taking on the properties of the “four humours” of medieval science. What ensues is a story of blackmail, family disputes, and some steamy romance for good measure. And yes, that's right. Organs that travel through history. Please enjoy this sample from the beginning of the book. Oh really? Your fingers feel a little tender? Maybe that’s because you’re eighty years old and you have acute arthritis. Anna struggled to control her frustration. An old woman seated herself in the facing chair and held out her right hand, splaying the fingers as best she could. The skin on the hand had gone translucent with age, with veins shining through it like the nerves of a jellyfish. The old woman glanced from the hand to Anna’s face, frowning. Anna steeled herself against the room’s broiling heat and wheeled forward on her stool. The time on the office clock was 4:11 p.m.
“Is the tenderness worse than usual?” she asked. “Well I’m not here for nothing,” the woman warbled. The woman threw up her chin and gazed about the room. “Sometimes it slips my mind. But I know something’s different in the knuckle there.” She pointed at her naked ring finger. No one at home to keep her company, Anna thought. Probably came here to chat as much as anything else. No wonder she’s defensive. She took hold of the woman’s hand and began massaging it – first the metacarpals, then the phalanges. The joints melted at her touch, and as she continued to rub, Anna glanced up at the woman’s face and noticed that her eyes had fallen shut. She couldn’t decide whether the face – jaundiced by the room’s wan, energy-saving light – resembled an icon of ecstasy or death. The flesh of the cheeks had slackened. The woman’s mouth fell away at the corners, half-gaping. It was more like death. “Okay,” Anna said, suddenly breaking the caress. She spun around on her stool and retrieved some medical stationery from the shelves behind her. She didn’t recommend an X-ray, though she knew the old woman had come looking for scans, graphs, images – anything and everything technology could do for her. Anything that would cost the public health care system a lot of money. What she gave the old woman was a prescription for a different kind of arthritis medication. At first, the woman looked as though she’d protest. But another glance at Anna’s handwritten prescription deflated her. Some part of Anna wanted to tell the old woman that her joint pain was perfectly normal. But she knew if she suggested nothing was wrong, the woman would fly into a huff and demand an X-ray. It would take hours to get her out of the ER. The woman finally gathered her things and left. Anna rose from her stool and left the examination room. In the waiting room, she glanced at a television that hung from the ceiling in a distant corner. Aerial coverage of Toronto’s Gardiner Expressway showed two queues of traffic: one crawling forward and the other not moving at all. A news ticker flashed across the bottom of the screen: “Cyclone in Bali kills twenty-seven,” followed by “Jackknifed truck kills twelve outside Mumbai.” The screen was there to remind everyone in the stuffy ER that there were worse places to be. She continued toward a row of vending machines and bought a bottle of water, tucking a clipboard under her arm. She took long pulls from the plastic bottle, not because she was thirsty, but because she wanted a bathroom break and didn’t feel right faking the need to pee. She glanced down at her feet, which were soaked from the grey slush people had tracked into the hospital. She could smell grime in the half-inch of water covering the floor. The janitors were always working at the stuff with their mops, hoping that no one would slip and break their neck. But the work wouldn’t end until their shifts were over. Then someone else would take their place, always mopping this same section of the hospital, which for Anna was starting to feel like Toronto’s communal mud-flap. When she’d finished her water, Anna dropped the bottle into a recycling bin and glanced toward the doors of the ER, where she saw the old woman from her office. The woman hunched her shoulders beneath a heavy coat and shuffled into the dark afternoon, a grey plastic bonnet affixed beneath her chin. Anna turned and stared up into the brown eyes of Terry Forbes, one of the paediatricians at Toronto General. She was used to seeing him staff the ER from time to time, even though his posting didn’t obligate him to do so. “The woman was in pain," she said. For the next few seconds, neither of them spoke. “So any plans for tonight?” Terry asked. Anna glanced down at her clipboard. The two of them had been on speaking terms for years, but their conversations had never strayed beyond the world of Toronto General. She’d heard Terry talk to other staff like this before. He had a big personality, and was very handsome for someone his age. Probably mid-forties, she figured, eyeing the threads of grey in his close-cropped hair and goatee. Several of her friends on the hospital staff – most in their late thirties – admitted to having romantic fantasies about him. And many of them, no doubt, would have swooned to have Doctor Forbes ask them about their evening plans. For her part, Anna could have done without the goatee. Terry nodded again and surveyed the bustling ER. Anna snuck a glance at his profile and lingered on the sinews of his tanned neck. Terry looked a lot like one of those older men from the home gym infomercials: a guy who could sell fitness equipment just by looking ten years younger than he actually was. “How about yourself?” she asked, staring at her clipboard. In the past year, Anna had thought about playing matchmaker between Terry and some of her older colleagues. But she’d heard from several friends that Doctor Forbes tended to chase younger girls. Her friends would always note this fact with a mix of injured pride and moral derision, but Anna tried to keep herself from feeling the same way. She knew it was naïve of her, but she was willing to give a lot of leeway to a man who spent most of his life caring for sick children. The main doors of the ER flashed open. A squealing clatter jarred the entire room to attention. Waiting patients looked up from their twiddling thumbs and magazines, while Anna took a few more seconds before letting her eyes rise from her clipboard. A man in a stained flannel shirt flew past her on a stretcher, his right hand bundled inside a cocoon of bloody gauze. Three paramedics hurled him down the hallway like a bobsled team. A fourth raced after them with a plastic cooler. Again, Anna stared down at her clipboard. Terry lingered for another moment, then turned to go. Anna made no reply, but glanced after him. Her eyes travelled down to his elaborate sneakers, which clashed badly with his lab coat. The sacrifice of fashion was understandable, though, since it was common for hospital staff to go up to fifteen hours without sitting. She lowered her gaze even farther to her own stiff black shoes, wondering if she could err a little more on the side of comfort. At this thought, a wave of fatigue washed over her. Her limbs flushed and sagged, as though she were wearing a suit of wet wool beneath her lab coat. She drew a deep breath through her nose and closed her eyes, trying to force oxygen to her extremities. A headache had swelled at the back of her skull, but her focused breathing managed to alleviate it for the moment. When she reopened her eyes, she cast them over the people sitting in the waiting area. They had returned their attention to their outdated magazines. One tattered cover even bore blood-red letters that asked, Will Bush Invade Iraq? Anna took one more deep breath and clicked across the waiting room tiles. Back in the observation room, she drew a new medical chart out of the door holder and found a pants-less man seated on her examination table. He was near the age of sixty, wearing a denim jacket and a weathered Navy cap. His boxers were emblazoned with images of poker cards. To see the denim jacket hanging down over his underwear made Anna want to laugh, but she only smiled. At this moment, someone in the hallway dropped a tray of metal instruments. The patient snapped his head toward the noise. His left foot shot out instantly, bouncing off Anna’s thigh. Anna stepped backward to brush the dirt from her leg. After she’d spent four more hours with walk-ins, Anna was told that she could go home. Activity in the ER had died down for the moment, but a secretary said the hospital would page her if things took a hectic turn. Returning to her station, Anna stepped up to a desk and swept packages of Kleenex and Tic Tacs into her purse. When she came back through the waiting room, she took more notice of the few patients who still occupied the grey, floor-mounted chairs, and settled on a solitary young man in a distant corner. He was flipping through an old copy of Sports Illustrated. He wore a black Iron Maiden t-shirt that boasted a colourful hoard of demons charging outward, scepters and battle-axes at the ready. A mop of jet-black hair half-covered his eyes, but she could tell from the contours of his nose and mouth that he wasn’t unattractive for his age. The young man suddenly glanced up from his magazine and caught Anna before she could avert her eyes. Rather than admit to spying, she wouldn’t let herself turn away from him. The resulting gaze lingered long enough for her to wonder if they’d agreed to an impromptu staring contest. But after a few more moments, she felt a fresh wave of fatigue and turned away. Her vision of the room had taken on a depthless, two-dimensional quality, as though she’d buried her nose in a book for hours and had just glanced up. As she folded her lab coat over her arm, a male nurse appeared from a nearby hallway. As she walked away, Anna snuck one more glance over her shoulder and saw the young man set down his magazine. He pushed himself out of his seat with difficulty and followed the nurse through a set of doors. Before disappearing, he found Anna’s eyes one last time. Anna could tell, even from across the room, that his irises were a blazing shade of blue. She would’ve thought he was flirting, had it not been for the deep sense of vacancy those eyes impressed on her. Watch your syringes, she silently advised the male nurse. A phone message was waiting in her apartment. Anna drew her coat from her shoulders and hung it in the front closet before stepping toward her answering machine. When she’d pressed Play, her ears tingled with the vibrations of her father’s baritone voice. “Hello, Anna. I’m just calling about dinner next week. Is there anything in particular you’d like to eat?” -- Click. Anna figured that most people would have found it strange to end a recorded message with a question. But her father was more than happy to leave a thought dangling. Her eyes wandered across her desk and settled on a silver-framed photo of herself and her parents. Taken at her medical school graduation, it reminded her of how much she’d inherited of her father’s Egyptian complexion. Throughout high school and university, she liked to think that her olive skin gave her a warm, even sultry look. But she also knew she had her father’s large gums, and often worried that they made her mouth look a little too equine. Her few boyfriends had always insisted that her mouth was beautiful, but she could never decide whether they were just patronizing her. One time in the third grade, a boy in her Art class had called her “horse-teeth,” and ever since, she’d taken the insult as incontrovertible proof that her insecurities were well founded. A sudden noise spun her toward the kitchen. Atop the counter, a grey short-haired cat glared at her with a monarch’s indignation. Anna hastened across the room to fill his food dish, adding a shrimp-flavoured treat to his regular helping of dry pellets. She glanced up at her kitchen clock – which showed 7:28pm – but spun away when the rotating second-hand began to hypnotize her. Was there any point in trying to sleep? Her keys clattered onto her kitchen countertop, next to the most recent copy of CMAJ, the Canadian Medical Association Journal. She bit the insides of her cheeks and rubbed her eyes with one hand, picking up the journal with the other. The first article she opened to was entitled “Estimated Epidemiologic Parameters and Morbidity Associated with Pandemic H1N1 Influenza.” She glanced toward her television and set the journal back down. The sofa’s plush leather pillows embraced her when she fell backward, her hair half-tumbling out of its workday elastic. Semmi padded alongside the couch and – after a quick inspection on his haunches – leapt onto her chest. His eyes fell shut. A deep purr rumbled inside his head as Anna wrapped her arms around him. For a few moments, her own eyelids lowered as she waded into the shallows of a dream. The more you do, a voice whispered, the more you CAN do. She returned to shore as quickly as she’d left it. Her eyes reopened to Semmi’s resting face. Careful not to disturb him, she reached for the remote. But even the static of the muted TV was enough to wake the cat, who turned his head toward the screen with slitted eyes. Onscreen, two darkly tanned young men traded punches on a nightclub’s dance floor. Their identical t-shirts and knee-length board shorts looked like uniforms. Anna changed the channel and watched a man and woman pressing their lips together, arms curled around each other’s half-naked bodies. She could tell that it was a Hollywood movie, but didn’t recognize it. The couple fell onto a bed together. Anna rested the remote on her thigh and watched. A clipped, rattling sound filled the apartment. Anna tried to ignore it, but drew herself upright when it became more violent. She searched for the sound’s source, and froze when saw that the rattle was coming from her hallway doorknob. She switched off the TV with a shaking hand and jumped toward the phone on her desk. But the moment she touched the receiver, the rattling stopped. A pair of shoes clopped down the hallway. At the sound of retreat, Anna forgot her fear and rushed to her door’s peephole. No one was visible through the hole. Her heart thumped against her temples as she unlocked the door and peered up and down the hallway. When she was satisfied that the person was gone, Anna re-locked her door and put on a pot of coffee. It would probably be only a few hours before the hospital called her back in. She picked up the medical journal on her counter. For the next hour, her eyes flitted between the text and her front door.